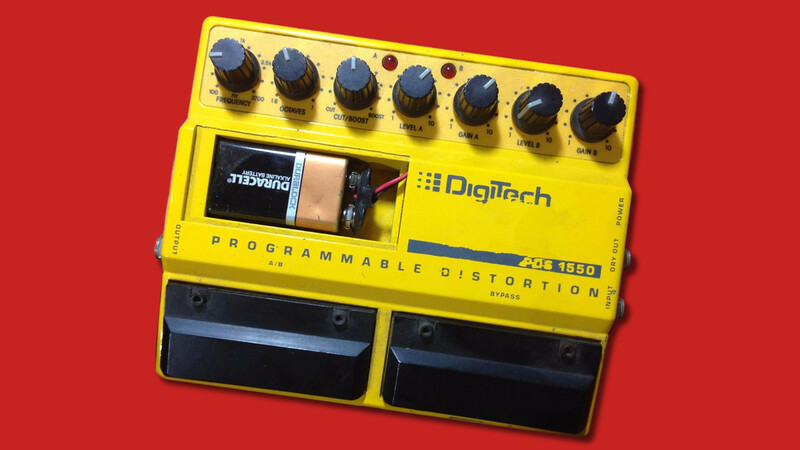 Posted February 23rd, 2018 by Tom Wiltshire & filed under Envelope Generators, LFOs, Projects, Stompbox stuff, Synth DIY. In the last six months, we’ve been very busy here in the Druid workshop, developing and testing new versions of our PIC-based chips. This work is now complete, so I’d like to introduce the new chips. Why bother? What was wrong with the old ones? Ok, there wasn’t anything much wrong with the old ones, but things have moved on since 2008 when most of them were originally developed – ten years ago already! Most importantly, Microchip have released a newer range of processors, the “enhanced” 16F series chips. 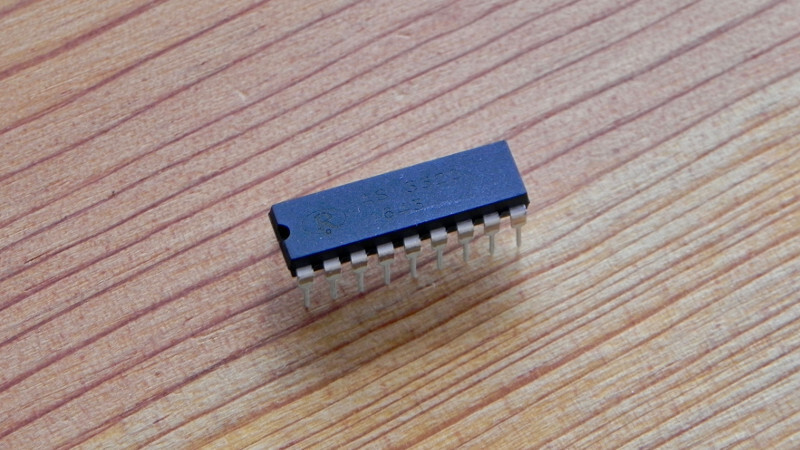 The original chips mostly used the 16F684 processor, which could run at 20MHz, but required an external crystal to do so. The newer chips can run at 32MHz, and no longer need a crystal. This saves parts and cost, and frees up a couple of pins for extra features too. This provided the motivation for a comprehensive update. The new designs increase the size of lookup tables, with data tables moving to 16-bit resolution and including interpolation for super-smooth results. The extra speed moves the sample output rate up to 31.25KHz, so there is an improvement in quality. 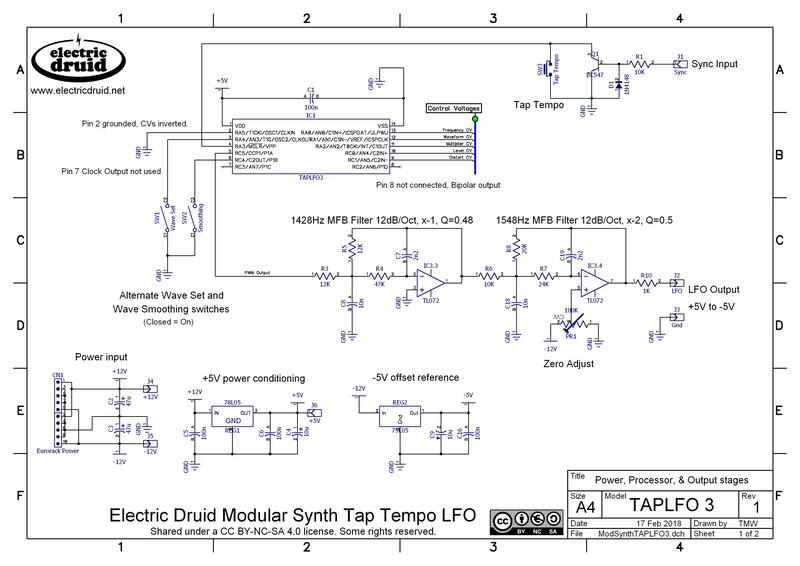 The original TAPLFO2D chip was one of our most successful and popular designs, and has inspired a range of exciting and versatile pedal projects. The TAPLFO3 chip released in February 2018 had a small bug in one of the arithmetic routines that caused it to run slightly slow when compared to the tapped tempo, especially at slower tempos. This has been fixed, and the switch debouncing has also been improved. You can read more about it here if you like. 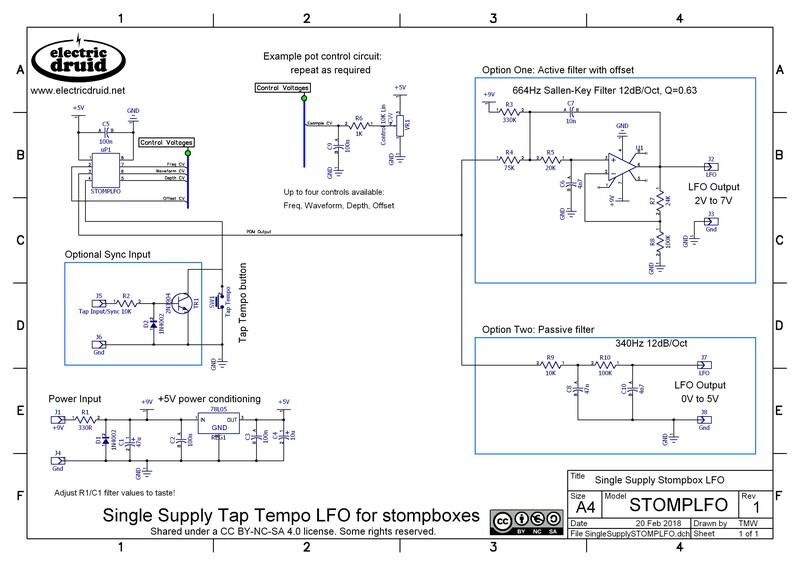 The StompLFO design is a simplified and lower-cost version of the TapLFO designed to fit in an 8-pin chip. As such, it can replace the typical dual op-amp Schmitt trigger/integrator LFO design that you see in a million stompbox and guitar pedal circuits. One significant difference from the other LFO designs is that it uses Pulse Density Modulation (PDM) instead of Pulse Width Modulation (PWM) for the output. This enables the output frequency to be much higher (2MHz instead of 10’s of KHz) and that means simple RC filters can smooth the output easily without losing any waveform detail. The Offset CV and Depth CV interact in an interesting way to allow the chip to produce bipolar or unipolar waveforms of either polarity. Furthermore, in between these extremes, it responds sensibly to increasing depth, making it easy to set up for a given situation. The diagram above shows the output for a Triangle wave with 0-5V Depth CV (in blue) and various Offset CVs (in red). The graphs show 0V Offset, unipolar positive “bottom up” depth control, 5V Offset unipolar negative “top down” depth control, 2.5V Offset bipolar “middle outwards” depth control,and finally 1.25V, which starts off bipolar until the output runs out of range, and then increases in a unipolar fashion. This allows full depth control without ever going beyond the lower (or upper) limit. The VCLFO was the first significant PIC project I ever coded. As I learned more and more I was able to add more features and make improvements, which is why it was onto version 9 before it made its public debut! 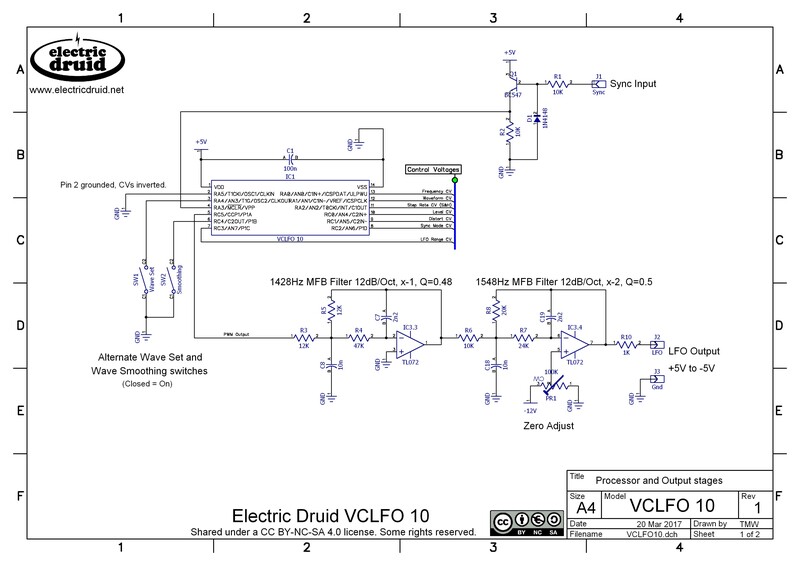 In the ten years since then, I’ve learned far more, and the new VCLFO10 takes advantage of this and does many things I wouldn’t have thought possible originally, like the random slopes waveform. Some of these new waveforms have already been put to good use in the Benidub DS71 Dub Siren. Pop over to their site and have a listen. All in all, it’s a big step up. I was never entirely happy that I had to have two separate designs to include the looping features I wanted on an envelope generator. The VCADSR 7B had Gate and Trigger inputs, and the LOOPENV 1B replaced the Trigger input with a Mode CV input that allowed selection of two looping modes or standard ADSR behaviour. It would have been possible to move the code to a 20-pin chip, but that would have been overkill. The new chip allows me to finally solve this problem neatly, and the ENVGEN 8 has both Gate and Trigger inputs, and the Mode CV and looping features of the LoopEnv. The other major improvement is that it now uses an on-chip 10-bit multiplying DAC. 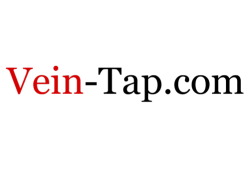 This not only means that the need for post-chip filtering is much reduced or eliminated, but also that the Level CV control can be done without loss of resolution. The output remains at 10 bit resolution at low levels as well as high. Additionally, the sample output rate has gone up to 31.25KHz, the tables have been improved, and we’ve added a Punch feature which gives your shortest envelopes more thump. The following diagram shows some example outputs with the three different modes (MODE CV) and the effect of the LIN/EXP selection input to select exponential or linear shapes. The first two modes respond to the GATE and TRIGGER input, but the LFO Looping mode runs constantly irrespective of Gate state. As ever, any comments, ideas, or corrections are appreciated. Please get in touch through the contact form. Thanks and enjoy the new chips! 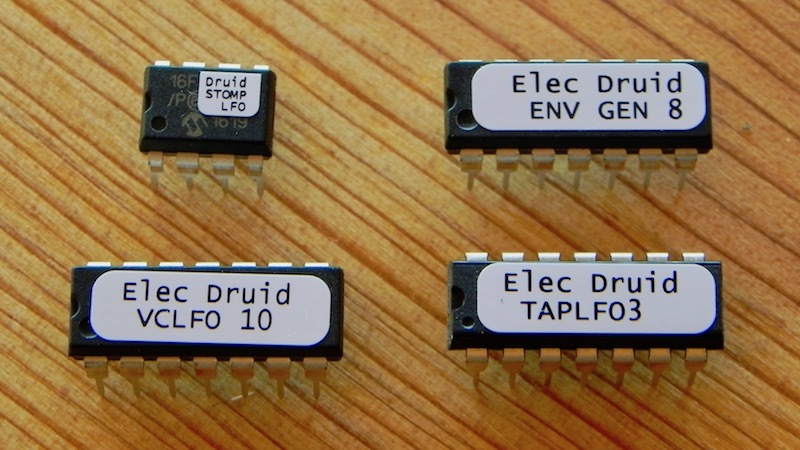 The TAPLFO3, STOMPLFO, VCLFO10, and ENVGEN8, projects, code and schematics by Tom Wiltshire for Electric Druid are licensed under a Creative Commons Attribution-NonCommercial-ShareAlike 4.0 International License. Here’s the legal stuff. Incredible, thanks sooooo much for sharing, this page is a goldmine! With all those new chips around I might finally go for that DIY Polysynth.. Anyway great work, keep it up! Tom Wiltshire, thank you ever so for you post.Much thanks again. Gracias por compartir estos diseños. ¡Eres uno de mis ídolos diy! One question: can the small 8 pin stomp lfo also used in a modular setting? 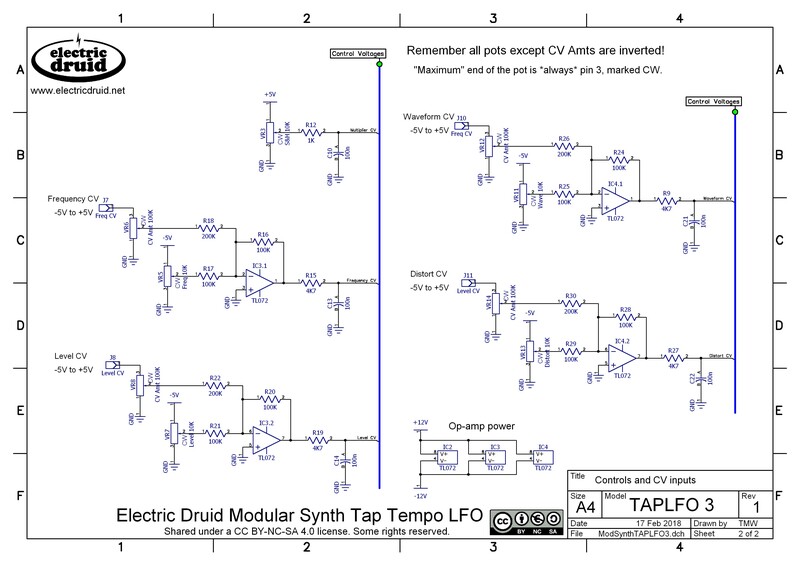 Using a similar schematics as the larger lfo? I am looking for a small and simple lfo to use in a modular synth (also a replacement for the usual analogue square/triangle) with minimal circuitry. Only CV input would be the tap tempo. But the output should be bipolar -5V…5V. Is it recommended to use the filter example from the other lfo? Or are there simpler solutions? Will there be more example schematics? There’s no problem using the StompLFO in a modular. 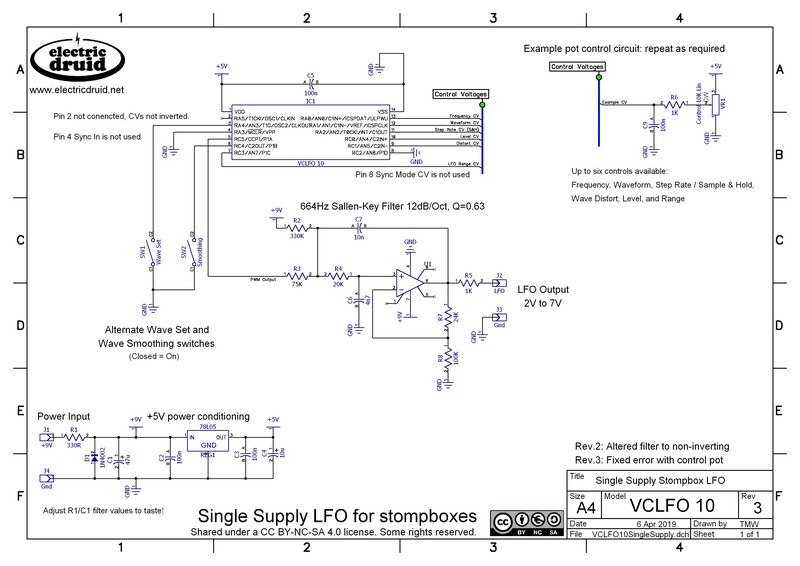 Yes, you can use the same CV input from the TapLFO schematic, but you’ll need to add an inverting stage as well – there’s no software “CV invert” option on the StompLFO. For the +/-5V output, you can use just the second stage of the TapLFO’s filter – the 1548Hz part with the offset and gain. There’s no need for a 4 pole filter with the StompLFO’s PDM output. 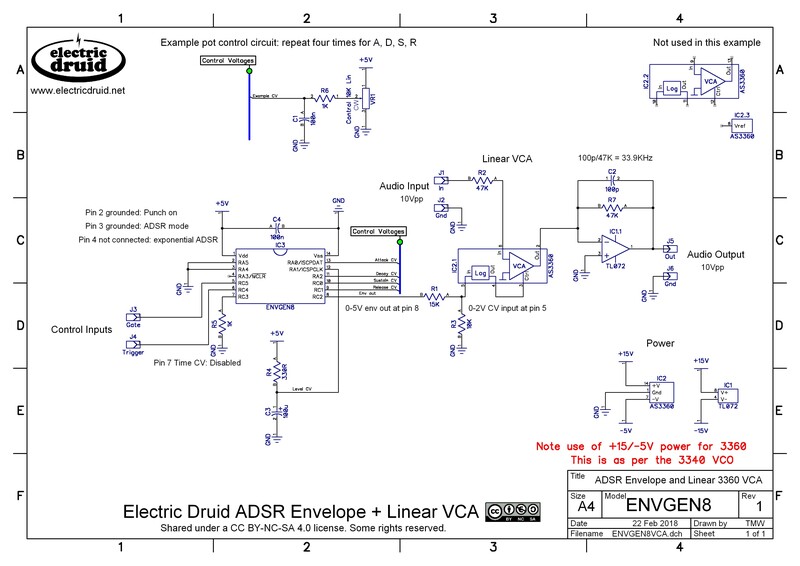 PS: There might be some more example schematics in due course…I’ve got a few things up my sleeve! I must say, your ‘creative commons’ sharing model is a wonderful example of the best of the synth community. Love this new ADSR, but got a problem the time settings, just work on a limited part of the pot, about from around the middle, it will not trigger the ADSR cycle outside this area,when I am using the gate input, but seems to work on trigger input.Will be thankful if you know why. And a great thank you for publishing the code! This is a problem. It shouldn’t behave like that. If you’re just using the Gate input alone, you need to connect the Gate and Trigger inputs together (e.g. feed the Gate to both inputs). It won’t work correctly with the Trigger input left unused. If you have more problems get in touch and we’ll get you debugged! I’m planning to build a TapLFO using the schemas given in the datasheet and adding a few more tips like a 7-segment display that would display values for multiplier and LFO waveforms. Maybe for Distort as well, but I have to think about it. I saw that in the TAPLFO3 application notes, the Waveform CV input can be powered in + 5 / -5V CV with a max amplitude handled by the VR12 potentiometer. In addition, manual adjustment is possible with the VR11 potentiometer. This one is supplied with -5V / 0V. What makes sense since IC4.1 is mounted in inverting amplifier. Yet (sorry for the silly question) what happens when VR11 sends 0 volts and VR12 receives, say, + 5V? The output of the amp comes out of -5 volts, right ? How does this affect the RA1 input of the MCU (Pin12) ? What happens is that the internal protection diodes start to conduct because the input has gone outside the supply voltage of the PIC. To protect the diodes, it’s important to limit the current that can flow. That’s why there’s a 4K7 resistor in series with the input – it’s not *just* there to act as an RC filter, although it does that too. Also, you’ll notice that the external CV inputs are shown with a 200K input resistor, so they are reduced to a +/-2.5V range. 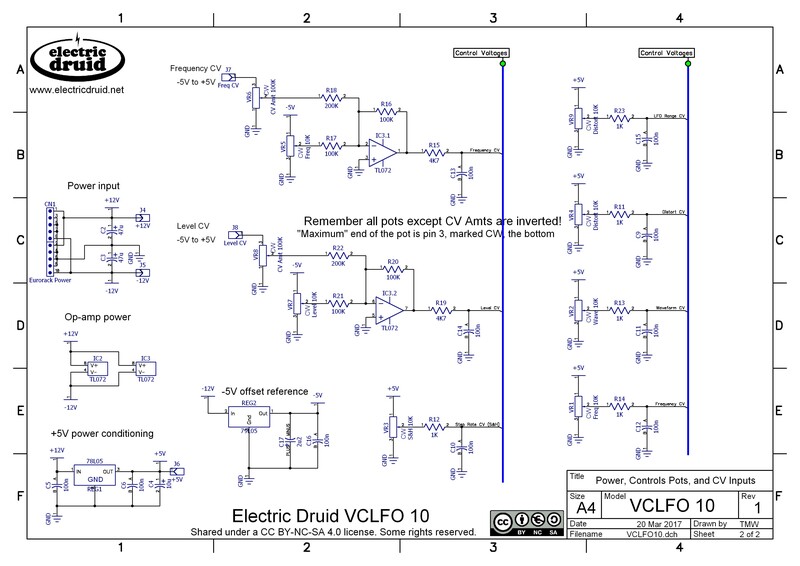 That still allows the CV input to cover the entire range of the control, but it also helps limit the amount of current that can flow in the diodes when the input goes outside the usual range. We used a circuit like this on the Frequency Central Waverider VCDO module, and as far as I know no-one has ever blown up one of the CV inputs, so it seems to be reliable and safe. 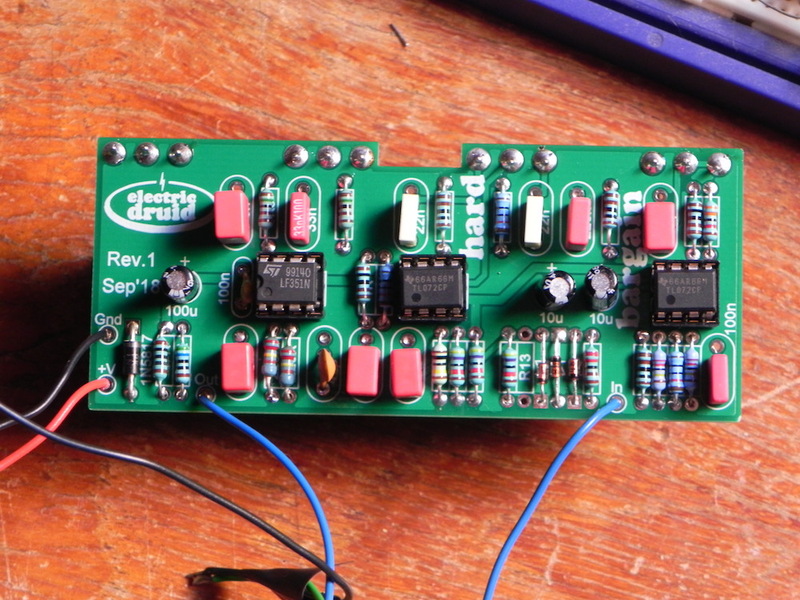 Good luck with your project – multiplier and waveform displays sounds great! 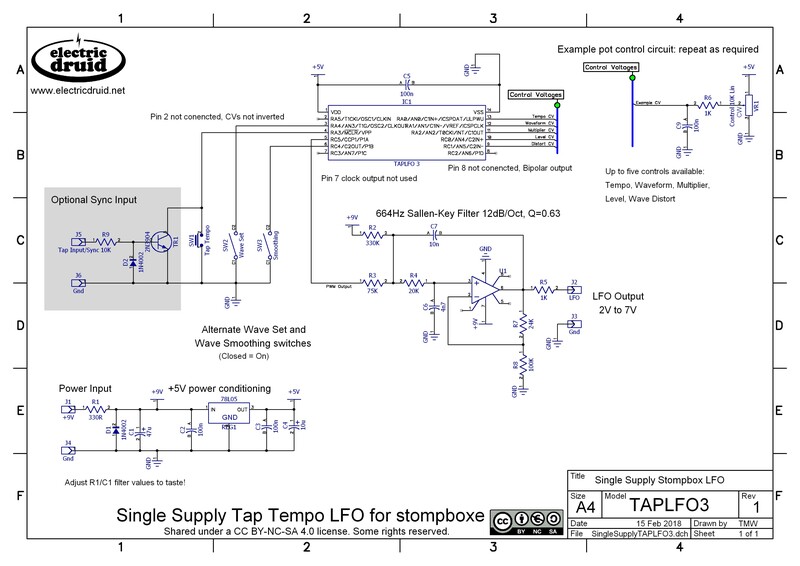 Is it possible to have a software LFO invert on TAPLFO or stompLFO on an unused pin ?? For example if I wouldn’t want to use the Clock output or LED output pin would it be possible to assign that pin as LFO invert? Yes, that would be possible. It’s easy to invert the output (just flip the values before they go out), and to do that based on the state of a pin is also very simple. The only awkward bit is setting up the pins correctly so that you’ve got inputs and outputs in all the right places! Email me if you need help with it.